This new tool allows you to install any kind or rod seal into hard to access housings, due that it gives the seal the optimum shape to be introduced, and later handled to be correctly installed, thanks to the tool’s depth, being able to introduce the seal into housings up to 100 mm deeper, that’s up to twice bigger than other existing tools. Thanks to its main axe, it allows the install of any kind of rod seal without any damage. You should only choose your install tool from any of available sizes. Thanks to its robust design and construction, there is no risk to loose any part of the tools. Easy-to-use. You’ll be ready to install any kind of rod seal in just 2 steps to be installed correctly, without any damage into any housing. Due its construction, allows you the installation of this kind of seal, in some sizes. It is advisable the installation of composite seals with this tool. This takes more importance in small sizes in order to avoid the stress given to the seal while installing. Due its construction, V-Packings can be hard to install. This takes more importance in compact ones, style AM. V-Rings can be easilly damaged during install due to its small section. In this case, it is advisable to be installed using an install tool. The most typical use of this tool are U-lip seals. 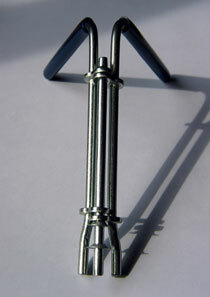 This tool can be used also with compact seal and spring energised U-Seal. All this makes the tool a must-have when installing any kind of seals. *Offer valid untill July 2006 or end of stock. This quote doesn't include taxes nor shipment. If you need more infromaion about this and other seals, don't hesitate in contact us or send-us an e-mail to >consultas@hidromar.es. New profile guide system is ready. Now it is working within our mainweb page from wich,and dinamically, you can get information about the most used style of seals. The new cathalogue is ready to download by seal style, to get this, you should follow the link included in the cataloue page. This system will be encharged in sending you, via e-mail, a file including the most updated information related to the seals you check. This server is available 24/7, and your orders and requests will be received directly at Comercial Hidromar at the same time you are proceeding allowing us to give you a quick reply. The orders will be sent within a maximum of 24 hours (withn our commercial opening hours), unless some incidents occurs in such case, we will contact oyu as soon as possible. This bulletin "Informativo Hidromar" is prepared for different enterprises and areas interested in news, profiles, and uses of the sealing industry. It is prepared monthly being sent via e-mail to all people interested in. The mentioning of events, also as information or elements not represented by Comercial Hidromar, S.L. is made only for information purposes, and doesn´t make any endorsement or advice. At the same time, it is not assumed any responsability by the selection, working, or use of such products events, or services. This bulletin, also as the rest of information at our web site are reviewed against electronic virus daily, and we take no responsability by any damage made by the reception of e-mail, please, check your devices frequently. Comercial Hidromar, S.L. doesn´t assume any responsabulity about the news here presented. Make the choice of your interest in order to receive or cancel the reception of this bulletin .